The Goalsetter Backboard Edge Pad is an excellent safety addition to your basketball hoop. This backboard pad offers added protection for players during layups or when the goal is lowered and hoop contact is more likely. Designed to continue performing season after season through all weather conditions, these edge pads have a tough urethane skin to maintain the color and for long-lasting durability. A steel insert in the edge padding provides strength at all mounting locations and stiffness along the backboard. Mounting hardware is included to secure the edge padding to your backboard. The backboard pads are available for all 48", 54", 60", and 72" backboard sizes and in four color options: black, blue, green, and red. Replace your worn out or damaged basketball net with the Goalsetter Anti-Whip Net. This heavy-duty braided white nylon net prevents the net from whipping up into the basketball hoop. The heavy-duty design is built to withstand the outdoor elements all year long in residential or institutional settings. Play the best with Goalsetter! 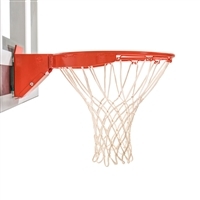 Goalsetter’s collegiate double spring rim styles are among the most durable on the market and offer solid steel construction, baked powder-coat finish, expanded degree of flexibility, and one-piece continuous attachments. The double spring rim features a continuous net lock for extra rim-to-net support and a 5x5 universal backplate. The breakaway rim can withstand 125-130 lbs. of down pressure for a 15-degree deflection and features a positive lock mechanism angled guard to prevent injury. 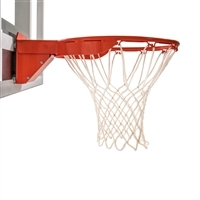 This rim meets NCAA, NFHS, and NAIA standards and includes mounting hardware and a nylon net. One hundred percent of Goalsetter basketball hoops and accessories are made in the heartland of the United States of America. Adjust the height of rim and backboard with the Goalsetter Crank Handle with swivel knob. 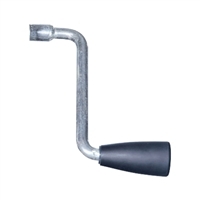 This replacement basketball crank handle fits all Signature Series Internal height mechanisms. Play the best with Goalsetter! The Goalsetter Basketball Pole Pad provides serious protection for serious players. With resilient 1.5-inch closed-cell foam padding on three sides, you'll never have to hesitate to take it strong to the hole or think twice about skying for a monster board. This protective pole pad is a must-have for any 4-, 5-, or 6-inch square-pole basketball system. Now playing it safe doesn't have to mean playing at half speed. This pad is wrapped in all-weather vinyl to provide extended life even in harsh conditions. It attaches to your basketball pole with 4 tailored velcro straps. Goalsetter’s double ring static rim styles are among the most durable on the market and offer solid steel construction, baked powder-coat finish, expanded degree of flexibility, and one-piece continuous attachments. The double ring static rim is a fixed rim with a no-fail net lock and a 5x5, 5 1/8 x 4 7/32, 5x4 – 4 ½ back plate. 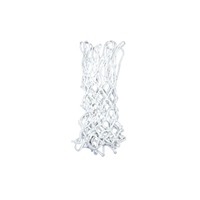 This rim includes mounting hardware and a nylon net. One hundred percent of Goalsetter basketball hoops and accessories are made in the heartland of the United States of America. The Goalsetter ground anchor hinge system provides a solid foundation to ensure superior performance and durability. Complete installation of a Goalsetter basketball hoop can be done before it is raised upright. The anchor system allows for easy goal assembly with no ladders or scaffold. The hardware uses Magni 577 corrosion resistant coating. The anchor allows the goal system to easily move with you. 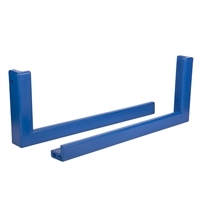 This anchor is compatible with 4” x 4”, 5” x 5” and 6” x 6” pole sizes. Play the best with Goalsetter! Goalsetter’s HD breakaway single spring rim styles are among the most durable on the market and offer solid steel construction, baked powder-coat finish, expanded degree of flexibility, and one-piece continuous attachments. The single spring rim features a continuous net lock for extra rim-to-net support and a 5x5 universal backplate. The breakaway rim can withstand 40 lbs. of down pressure for a 15-degree deflection and features an angled guard to prevent injury. This rim includes mounting hardware and a nylon net. One hundred percent of Goalsetter basketball hoops and accessories are made in the heartland of the United States of America. Prevent play when you’re away with the Goalsetter Pinlock. 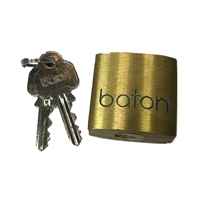 This durable outdoor lock set includes two keys and prevents unwanted rim height adjustment on your Signature Series basketball hoops. This keyed lock locks your basketball hoop’s height adjustment in place and is compatible with all Signature Series internal height mechanisms. Play the best with Goalsetter! Goalsetter’s single ring static rim styles are among the most durable on the market and offer solid steel construction, baked powder-coat finish, expanded degree of flexibility, and one-piece continuous attachments. The single ring static rim is a fixed rim with continuous net lock for extra rim-to-net support and a 5x5 universal backplate. This rim includes mounting hardware and a nylon net. One hundred percent of Goalsetter basketball hoops and accessories are made in the heartland of the United States of America. The Goalsetter Wrap Around Pole Padding wraps around your square basketball pole and stands a full 72" high. The pole pad is designed to fit snugly on your 4" square poles. The 2"-thick polyfoam padding provides added protection your family needs during aggressive play. Easily and securely install the pad using eight tailored tight-fastening Velcro straps. The pole pads are available in various team designs and color options as well. Goalsetter – the best in basketball. Made with pride in the USA.